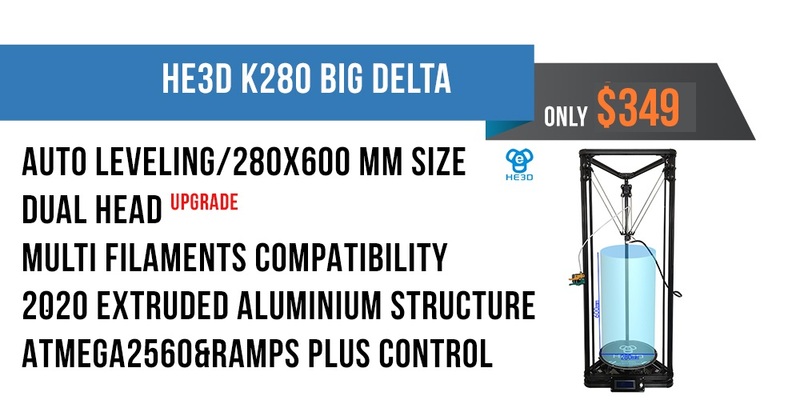 Welcome to the HE3D family of Delta style 3D Printers. The K280 breaks from the traditional limitations of Cartesian printers in offering precision and speed with a Extra Large build volume of almost 9000 inches (11 in. diameter x 23.6 in. height)! The kit is built with the new enthusiast and experts in mind. With high quality 2020 aluminum extruded beams and acrylic forms the construction is simple, yet very robust. The E3D single extruder, capable of up to 260C, opens the possibilities to almost all filament material including PLA, ABS, TPU, WOOD, PVA, Nylon, PVA, PP and most of their variants. The upgraded LCD interface and ATmega2560 control board, expandable to dual print heads, with RAMPS PLUS and 80 step precision motors this printer can achieve ultra-high quality prints down to 12 micron X,Y and 50 micron layer accuracy. The kit includes all necessary tools and requires no soldering. The K280 DYI kit is simple to build and includes detailed video instructions from unboxing to printing. With lifetime customer support you're never more than 24 hours away from help. The K280 3D Printer DYI Kit includes: K280 printer with single extruder/Dual(upgrade), 11 inch (280mm) heated print bed, 400W power supply, 2 roles of PLA filament, 4 print nozzles (0.2, 0.3, 0.4, 0.5), 2GB SD card, additional tools, print bed tape, 12 months warranty, lifetime support. ROBUST FRAME: 2020 extruded aluminum with acrylic supports for greater stability and true angles for high accuracy prints with an 11 inch diameter x 23.6 inch (280mmx600mm) tall build volume. FULLY CUSTIMIZABLE: Expandable ATmega2560 and integrated RAMPS PLUS control board supports dual print heads, heated print bed, and upgradable pro-extruder to support exotic material like flexible rubber. EASY TO BUILD AND READY TO PRINT: No soldering required, all required tools included, auto-z calibration for easy bed level setup, complete build video tutorials, 4 extruder nozzles (0.2, 0.3, 0.4, 0.5), two rolls of PLA filament, additional tools, and 2GB SD card and USB cable to connect to your Windows/Mac/Linux PC. EXCELLENT SUPPORT AND WARRANTY: Lifetime support with less than 24h response time and a 30-day money back guarantee. Our goal is 100% customer satisfaction. If something is broken or damaged, we will replace the part free of charge and free shipping. Honestly, I really like this purchase. The DESIGN is quite nice. Most of the parts are great, and customer service is very good in case some parts aren't. There is a lot of support for this particular printer on thingiverse and elsewhere on the internet. If you're willing to put some time into making this printer nice, it is a very great purchase and makes really nice, large prints. Works pretty well, the carriages don't tighten all of the way to the rails making the print head a little wobbly. I'm printing replacement carriages though and otherwise it works great! Great machine for the price. Makes stunning prints once you get it properly calibrated. Good to tinker.